Drops from a leystone seam. Must have completed A Lenda de Rethu Chifre de Ferro (a quest chain that begins with Os taurens de Alta Montanha) for this to drop. The drop rate for this is completely RNG dependent. It could take you many many attempts, or it could come quickly. To maxmize your time while looking for this item, I recommend mining in the water of the north-western quadrant surrounding Nar'thalas Academy in Azsuna. There are 2 seams which spawn underwater here. They will either be Felslate or Leystone, and respawn every 5-6 minutes. There are also nodes at various points around the shore here. Use your Waterstrider to navigate the surface, and avoid the Giants and the Naga with their Murloc minions. After mining out the 2 seams, park yourself on the Eastern shore and fish. You'll skill up your Fishing while skilling up Mining. Finally got this item today after a few days of farming for leystone seams about 1-2 hours each day. 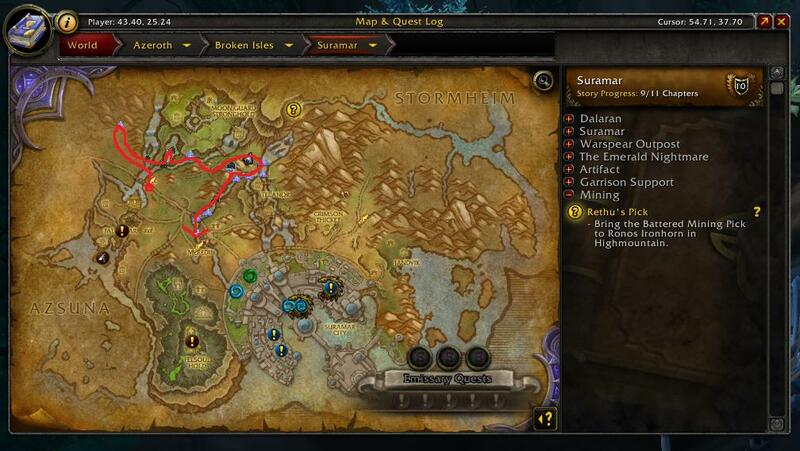 I've mined around 100 seams randomly encountered throughout the Broken Isles and then decided to take a quick route in Suramar until it dropped. It really looks like the drop chance is very RNG based and very low aswell. I recommend going around Suramar, especially in the area around Irongrove Retreat as you encounter lots of seam nodes in the water pools and the caves around. Furthermore, another area where you should look for seams is on the river beds between Telanor and Moon Guard Stronghold. (Do note that the GatherMate icons displayed on the map are for the seam nodes locations. Do also note that leystone seams can spawn instead of felslate seams and vice versa. Proof of acquiring the item by the quest in the log on the right). As another tip, the areas inbetween Irongrove Retreat, Moon Guard Stronghold, Telanor, Fal'anar and Meredil (so basically all of the north of Suramar) are very good for farming ores in general. You will encounter both felslate and leystone nodes in consistent amounts. I got it a couple days ago, and started the quest, but now it's gone. The quest. It's gone, I never finished it, it's just vanished.